Clearly, there was logic in the combination of the two companies but, the weak valuation alongside the proposed structure of the deal, (effectively ceding control of Xerox to Fujifilm without them spending a dime) led to lawsuits from Darwin Deason (with around 6% ownership) that, operating in alignment with Carl Icahn (with around 9% ownership), resulted in the deal having to be abandoned. Jeff Jacobson, the CEO who negotiated the deal, was eventually removed along with five of the nine board members. Icahn has now put his team in place, including CEO, John Visentin and five new board members, and effectively dictates what happens next. Icahn has already said he would listen to offers in the region of $40 per share, or an overall valuation of around $10 billion. Who can afford to pay $10 billion? Who else could it make sense for Xerox to combine with? It's clear that, to a large extent, the two companies are interdependent and that both would face uncertain futures as independent entities. Neither entity can realistically relish the prospect of a separation and a resulting "go-it-alone" strategy. However, Xerox may have the upper hand in a strategy of brinkmanship which could result from the threat of a separation. Despite the risk of legal action, if Xerox believes it has sufficient grounds to break up the joint venture agreements, relying on the Fuji Xerox accounting scandal as its basis, then it may well do so. It would then be free to move forward with strategies to capture market share in the Asian markets under the umbrella of its Xerox brand, a brand that Fuji Xerox has developed over the last 50+ years and (in this scenario) would no longer be able to use. 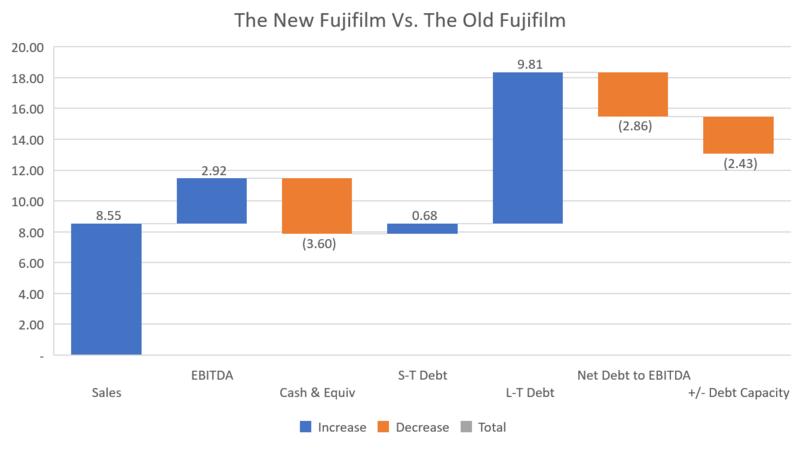 In the longer term, this outcome would most likely be disastrous for Fuji Xerox and its parent Fujifilm. Xerox is the single largest customer of Fuji Xerox, and is a customer they can ill-afford afford to lose. Conversely, Xerox is heavily dependent on Fuji Xerox as the source for its hardware and, unfortunately, cannot easily find a new partner to buy from. While they have worked with Samsung in the past, the Samsung printer business now belongs to Hewlett Packard and can no longer be considered a viable alternative. However, this equipment sourcing dilemma could be less problematic for Xerox if an alternative OEM, with their own hardware capabilities, were to seek to acquire them in a "horizontal" merger. Possibly, the worst nightmare for Fujifilm is the termination of the joint venture agreements and the facilitation of a sale of Xerox to a "hardware-capable" competitor. For example, let's consider the prospect of Hewlett Packard as a potential buyer. Such a combination would provide Xerox with an alternative source for its hardware requirements (thereby reducing the risks of a separation from Fuji Xerox) as well as enable it to aggressively compete with Fuji Xerox in the Asian markets, immediately able to leverage HP's sales and marketing infrastructure to accelerate the process. It's this possibility that Icahn and Deason are probably relying upon to motivate Fujifilm to revisit the 100% cash deal (which included a 30% control premium and valued Xerox at around $10 billion) that had originally been tabled in early 2017. That deal discussion was terminated by Fujifilm in July 2017 (supposedly) because Xerox had become too expensive (despite a 3% decline in the share price) and as the scale of the Fuji Xerox losses from the accounting scandal started to become known. Fujifilm has annual revenues of around $21 billion, almost half of which are generated by the Fuji Xerox joint venture, along with almost half of their total operating profits. In short, Fuji Xerox is very important to Fujifilm and, knowing this, Icahn and Deason will leverage it to the hilt as the next steps in the saga start to take place. Fujifilm must perceive there's a significant risk Xerox will terminate the joint venture and that the subsequent threat of a sale to a competitor, such as Hewlett Packard, will emerge. However, because they cannot allow this to happen without putting their existing business at risk, they, ultimately, will pay $10 billion to acquire Xerox in an all cash deal. This is the desired outcome for Icahn and Deason and will net the two of them an extra $465 million (over the May 2018 share price) for their efforts. Is a $10 billion deal feasible for Fujifilm? It seems clear that, yes, a $10 billion deal is feasible for Fujifilm. As already noted, this is where they started out back in January 2017 before they sensed they could buy Xerox on the cheap by taking advantage of a weak management team and board of directors. Believing they could structure a deal that eliminated a cash outlay while still gaining control and, knowing it's extremely rare in a proxy battle for a shareholder vote to go against the recommendation of the board, they steamed ahead. However, what they didn't count on was the Deason law suits filed to try and prevent the deal and an extraordinary ruling by Judge Ostrager that exposed the conflicted CEO and board of directors. 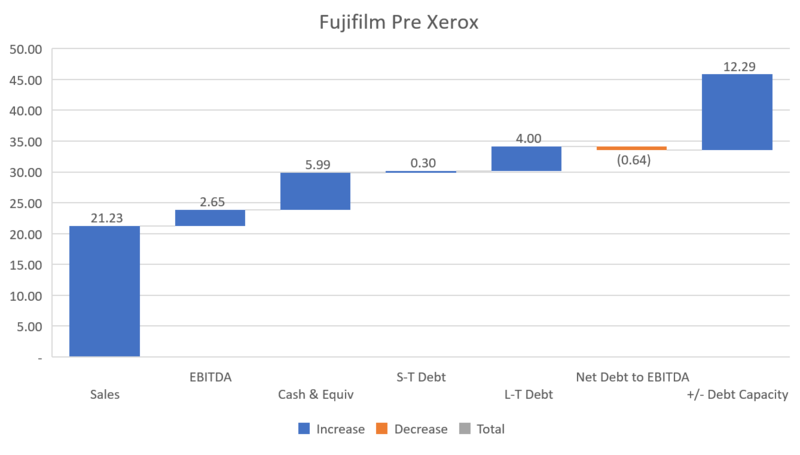 A combination of Xerox and Fujifilm would have almost $30 billion in annual sales and, assuming successful implementation of the $1.25 billion of synergies already identified, would generate around $5.6 billion in EBITDA. 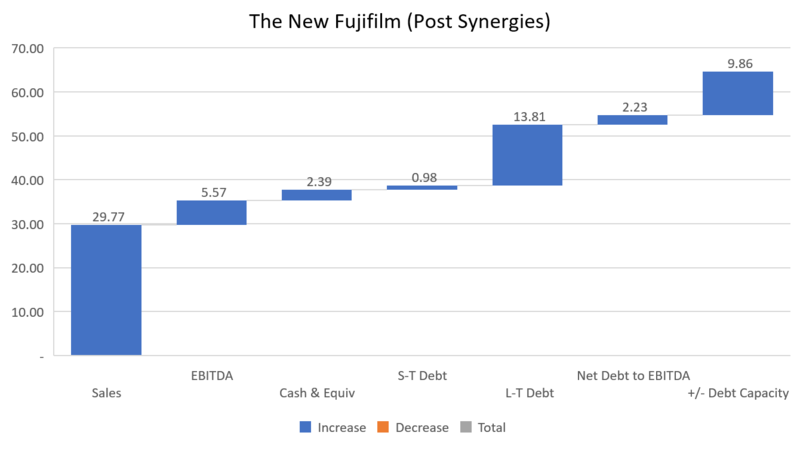 If Fujifilm were to fund the acquisition with $5 billion of its $6 billion cash hoard and finance the $5 billion balance of a $10 billion deal with debt, their overall debt position would still only be 2.2 times annual EBITDA, leaving capacity for nearly $10 billion of additional debt funding should it be required for future business development purposes. Chart 1: Key Income Statement and Balance Sheet indicators based on last reported earnings report from Fujifilm. Chart 2: Proforma Income Statement and Balance Sheet indicators based on acquiring Xerox for $10 billion, achieving $1.25 billion in synergy savings, and financing the acquisition with $5 billion in cash and $5 billion in new debt. Chart 3: Key changes to the Income Statement and Balance Sheet indicators following the acquisition of Xerox. The biggest risk for Fujifilm may now be that, having tried to gain control on the cheap and failed, they have to negotiate with a hard line CEO and board of directors placed largely by Carl Icahn, the man who became their arch enemy while successfully opposing their "cut-price" deal. However, what they may have also inadvertently woken others to (such as Hewlett Packard), is the possibility of entering a deal that may result in a bidding war, serving to elevate the premium beyond 30% and above $40 a share. Xerox shareholders appear poised to benefit from the travails of Icahn and Deason, even though they most likely would have settled for the original deal proposed by the now ex-Xerox CEO and endorsed by their prior board of directors. Within the existing joint venture agreement, Xerox cannot effectively be sold to anyone (except Fujifilm) because the buyer would have no say in the running of Fuji Xerox and unable to independently and exclusively make and sell Xerox products in Asia until early 2023. So, the scenario may be for Xerox to exit the joint venture agreements (including the "Joint Enterprise Contract" and the "Technology Agreement") with the basis for the termination being the Fuji Xerox accounting scandal which, on April 24, 2018, Fuji Xerox finally disclosed amounted to $470 million, (more than 30% higher than their original estimate) and for which Xerox is responsible for 25%, or $118 million.